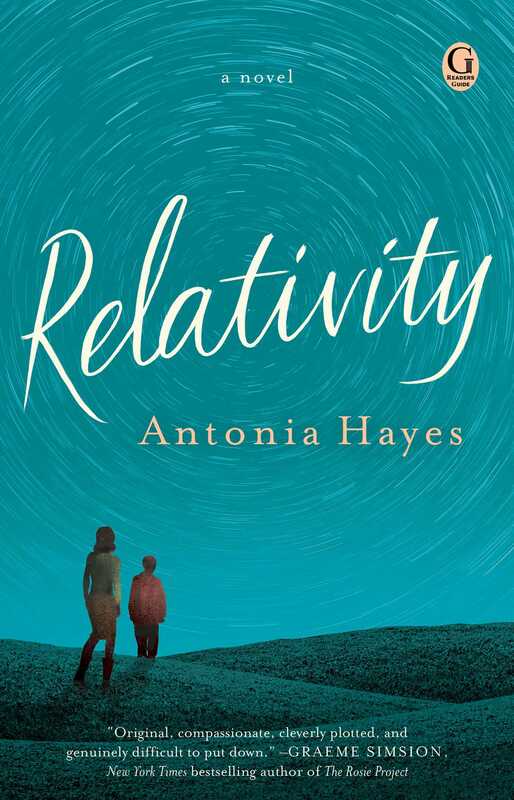 This reading group guide for Relativity includes an introduction, discussion questions, ideas for enhancing your book club, and a Q&A with author Antonia Hayes. The suggested questions are intended to help your reading group find new and interesting angles and topics for your discussion. We hope that these ideas will enrich your conversation and increase your enjoyment of the book. Heart-wrenching, absorbing, and magical, Relativity is an irresistible novel about science, love, unbreakable bonds, and irreversible acts. Ethan is a bright young boy obsessed with physics and astronomy who lives with his mother, Claire. He knows little about his father and what happened shortly after his birth. Claire’s life is centered on Ethan; she is fiercely protective of her talented, vulnerable son, keeping the events of the past a closely guarded secret. But when Ethan falls ill, tied to a tragic event from when he was a baby, her tightly held world is split open. When Ethan secretly intercepts a letter addressed to Claire, he unleashes long-suppressed forces that—like gravity—pull the three together again, testing the limits of love and forgiveness. 1. Explain the significance of the title of the book. Did your interpretation of the title change as you read? In what ways, and why? 2. Hayes writes that “secrets were like scars: they faded and softened, but as much as you tried to camouflage them, they didn’t completely disappear” (pg. 85) Do you agree? What secrets are the characters in Relativity keeping from each other? How do these secrets cause damage? 3. Relativity begins with the line “Before you hear any words, you can hear the panic” (pg. 1). Who do you think is being addressed? How does the opening passage affect your understanding of the events in the story? Why do you think Hayes chose to use second person in this passage? 4. When Mark visits his father, John, in the hospital he “listened to John’s labored breathing, unsure what to think—should he feel sad?” (pg. 33) Why is Mark so conflicted at his father’s deathbed? Describe Mark’s relationship with his father. Do you think it is a healthy relationship? Why or why not? Does Mark’s relationship with John affect the way he interacts with his own son? If so, how? 5. When Ethan and Will are summoned to the principal’s office after their fight, Will’s mother, Helen, reveals information about Ethan’s father. What reasons does Helen have for making such an explosive disclosure? Do you think they are warranted? What are the effects of Helen’s actions? 6. Although Ethan has “never had a friend who was a girl before” he and Alison click immediately. She “was different, but she got him, she understood” (pg. 189). Discuss their friendship. How does it help both of them? Do you think that Alison is a good friend to Ethan? How is she able to understand Ethan in a way that others cannot? Do you know anyone like Alison? 7. When Dr. Saunders tells Claire that Ethan is “a remarkably gifted child” she receives his words with trepidation, feeling “like she was walking underwater. She knew what it was like to be called gifted, understood the danger of that word” (pg. 161) Explain Claire’s reaction to the news. Why does Claire think that being gifted could be dangerous? Has being gifted been detrimental to Claire? If so, in what ways? 8. Ethan “knew [Mark] wasn’t a dangerous man. He was gentle and generous” (pg. 248). Do you agree with Ethan’s assessment of Mark? Why or why not? What were your initial impressions of him? Do you think that Claire was justified in ignoring Mark’s letters? 9. Compare and contrast Claire’s relationships with Mark and Simon. What does each man offer Claire? Do you think either was a good partner for Claire? Why or why not? 10. Hayes writes “Clean slates had invisible consequences” (pg. 198). Do you agree? Mark moves to the other side of the country in order to restart his life with a clean slate. Is his effort successful? What did you think about his life in Kalgoorlie? 11. Mark tells Ethan “There’s a big difference between being a biological father and being a dad” (pg. 340). Why does he say this to Ethan? Has Mark been a father to Ethan? Explain your answer. Describe their relationship. 12. Ethan is fascinated by astronomy and “nothing was as beautiful to Ethan as the constellations” (pg. 92). In fact, the first time the reader encounters Ethan and Claire, Ethan is pointing out constellations to Claire as they wait to watch the Orionid meteor shower. What is it about constellations that Ethan likes so much? Are other stars mentioned in Relativity? Which ones? What do they symbolize? 13. John’s dying wish is to see Ethan. Why has Claire kept John from seeing Ethan? Do you think she’s right to do so? Why or why not? What would you do if you were in Claire’s situation? 14. Claire tells Mark “selective memory is crucial to survival” (pg. 344). What does she mean by this statement? Do you agree with Claire? Whether knowingly or not, many of the characters in Relativity have blocked out memories in order to move forward in their lives with varying degrees of success. Describe some examples. Are any of the characters successful? Which ones and why? 1. Although Mark “didn’t exactly identify with Jude Fawley,” he loves Jude the Obscure (pg. 54). Read Jude the Obscure with your book club. Why do you think that book resonates with Mark in the wake of his mother’s death? Are there any passages in particular that would be comforting to Mark? Discuss them with your book club. 2. On their first outing, when Mark asks Ethan to hold his sweater, “Ethan made sure his dad wasn’t looking and held the jumper up to his nose. He inhaled quickly. This was his father’s smell—soap, wool, wood—which was different to Mum’s. He tried to store the scent in his memory” (pg. 227). Smell can be a powerful key to memories. Are there any scents that remind you of a particular event or person in your life? What are they? Share the stories—and scents—with your book club. 3. Will tells Ethan “I know everything about you. We’re best friends.” (pg. 25). Do you agree with Will’s definition of being someone’s best friend? What does being a best friend mean to you? 4. To learn more about Antonia Hayes, read reviews for Relativity, and read her other writing, visit her official site at http://antoniahayes.com. While you’ve published many articles, Relativity is your first novel. Congratulations! What was the experience like and how did it differ from your journalism? Thank you! I’ve always written fiction but found it much easier to publish journalism. Articles and essays are short sprints but novels are more like marathons. I worked on Relativity over eight years, although there was an almost four-year window when I didn’t even open the document (I consider that my “necessary training” montage). Novels require more creative problem-solving and imagination so there’s lots to contemplate and consider: plot, character, setting, theme, and style—and on a bigger scale. Time is an essential ingredient when you’re writing something book-length too, but I loved spending years in the universe of Relativity. If I were the kind of person who actually enjoyed running, I’d definitely choose long distance. Is there anything that has been particularly rewarding about publishing Relativity? Can you tell us about it? There are two things I’ve found hugely rewarding and one of them was unexpected. The first was seeing the dedication page because I dedicated Relativity to my son. Slaving over that manuscript for years was ultimately always for him. The second—more surprising—reward has been speaking to readers. Hearing their thoughts about the novel, their interpretations of the story, and their reactions to the characters always blows me away. But I never anticipated how much readers would want to confide in me, telling me intimate details about their own lives and why Relativity affected them personally. I’m beyond grateful for their connection and trust. Now that you’ve published your first novel, is there any advice you wish you had received prior? What would you like aspiring authors to know? This isn’t original advice but I’d never entirely believed it before going through the process of publication myself. We always hear authors say “Just enjoy the writing, don’t focus on getting published,” and I'd always thought in the back of my mind it was easy for them to say—they had a book deal! I realize, now that I’ve published my first novel, they weren't just being self-righteous; they were right. Writing and editing Relativity have brought me far more joy and satisfaction than signing contracts or even holding the physical book in my hands. Don’t let anxiety about publication distract you from doing what you love—writing. Can you tell us about your writing process? When you began writing Relativity, did you know how Ethan’s story would end? Although it took me eight years to write Relativity, the writing process during that time wildly fluctuated. The character Ethan arrived first and I knew almost immediately that he loved physics. After a few false starts (originally the story was told only through Ethan’s point of view but that didn’t work), I completed the first draft of the novel in around six months. Then I gave it a rough edit and sent it to my (now) agent. She liked the premise of the book but said there were several problems I needed to address. This was where my four-year stumbling block began; I had no idea how to address the problems. But I didn’t waste those years—Relativity was constantly in the back of my mind. Even though I wasn’t actively writing, I was doing a lot of passive brainstorming and reading. Once I figured out where I needed to take the book, it took six months to rewrite it again. By then, Ethan’s story had changed completely. Lots of elements in the novel sprang from my research about neuroscience and physics that I’d done over those eight years. The study of physics forms an important conceit in Relativity. The passages where Ethan can “see” physics in action are beautifully detailed and descriptive. How were you able to create such vivid scenes? What kind of research did you conduct before crafting those scenes? When I was a child, I had a natural aptitude for understanding numbers and spotting patterns. My brain still works a little like that. I’m also quite a visual thinker, so when I was imagining physics in action—like the way sound waves compress or how heated molecules vibrate—I could almost see it myself, inside my head. Over the years, I’ve read so many books about different branches of theoretical physics too and especially loved studying the diagrams. For the scene where Ethan and Dr. Saunders play Ping-Pong, I also tried to teach myself topspin and backspin using a real paddle and ball—but my hand-eye coordination isn’t that great so I never nailed it. Christos Tsiolkas praised your writing saying, “Hayes is a convincing writer and a true storyteller: her characters are alive.” All of the characters in Relativity are very human and very real. How were you able to create such convincing characters? Where they based on anyone you know? I’m often asked if Ethan is based on my son, given that Relativity was published when they were approximately the same age. But when I created Ethan, my son was only four years old so he didn’t directly influence that character (although my son really did once compare my reproductive system to The Hunger Games). If anything, Ethan is much more like twelve-year-old Antonia. At school, I was that mathematics and science nerd with big frizzy hair and oversized glasses. I went to Math Camp and I’ve always loved equations. Like Mark, I even have a physics tattoo: the equation for the speed of light (not E=mc2). Claire is very different than me because she grew out of my own anxieties about motherhood. She’s basically the anti-me since her character is based on someone who might have made opposite choices than I’d have made myself. But her fierce love for Ethan is very much based on my real feelings about my son. The character Alison is based on my real best friend. In fact, she’s also named Alison. Many readers have told me that Alison is their favorite character and this makes sense to me because the real Alison is my favorite person. Quark is based on the real Alison’s rabbit, Spanky, and Dr. Saunders is named after Alison’s husband, Stew. Stew is also a doctor but his bedside manner is much better than that of Dr. Saunders. One character who’s completely imagined is Mark; nothing about him is based on anyone I know (except for writing a PhD thesis, that was something I lived with for years when my husband was writing his own). For a long time Mark was the least convincing and most problematic character in Relativity. He didn’t quite ring true and his behavior was inconsistent throughout the novel. It took years of thinking and rewriting to make Mark feel more human and convincing—I just had to get to know him, I suppose. While elements of some characters are loosely based on real people, all their stories are entirely invented. So what these characters say and do in the book wasn’t drawn from real life but rather was dictated by Relativity’s story. Books play an important role in Relativity. Mark draws solace in reading Jude the Obscure, Alison asks Ethan to read her Alice in Wonderland, and Ethan is inspired by the works of Stephen Hawking. Were there any books or authors that inspired you while you were writing? Can you tell us about them? Ian McEwan has been my favorite author since I was a teenager. I love his writing style and the way he incorporates real science into his narratives. His novels inspired me to want to be a writer. Alice in Wonderland is one of my favorite childhood books, and several other novels I loved as a child have influenced Relativity including A Wrinkle in Time by Madeleine L’Engle, and two Australian children’s novels: The Best-Kept Secret by Emily Rodda and Playing Beatie Bow by Ruth Park. All these stories have a common theme: time-travel! The work of Oliver Sacks was also a huge inspiration. Years ago, my (now) husband lent me his copy of The Man Who Mistook His Wife for a Hat and I devoured it on one sitting, on a flight between Paris and Sydney. I vividly remember reading it on the plane and scribbling notes; several key ideas for Relativity’s story came from that book. Graeme Simsion writes that “the shocking revelation [in Relativity] is tempered with real insight as to how such things happen.” While some of the characters in Relativity have done awful things, you have managed to humanize them and contextualize their actions. Were you able to identify with your characters and the choices they made? I really wanted to create characters who felt authentic, but I didn’t necessarily need to identify with them to write them. What I did need was to empathize with their decisions and judgments, and understand the context for their thought processes. So I had to feel compassion for them even if they made choices I wouldn’t necessarily make myself. That wasn’t easy but I spent a long time getting to know these characters (eight years!). Through writing Relativity, I learned that when we extend empathy to other people (fictional or real) we discover that everyone has a universe inside them, whether we identify with them or not. I had to figure out how to live in my characters’ individual universes and that taught me a lot about interpreting other people’s behavior. What do you like your readers to take away from Relativity? I don't have much control over what readers take away from the novel, that's completely up to them! I suppose, if anything, I’d like readers to think about complexity and duality: how good people can do bad things, how things aren't always black and white. Duality doesn’t just apply to light being a particle and a wave at the same time; human behavior is probably more counterintuitive than theoretical physics. Everything really is relative and sometimes we need to put ourselves in someone else’s shoes—look at the world from another angle—to remind ourselves that we’re not the center of the universe even though it feels that way most of the time. All of us contain paradoxes. Are you working on anything now? Can you tell us about it? Right now I’m in the early stages of planning two more novels, although I’m still not sure which idea will grab me most and demand that I write it next. Physics is the background hum of Relativity and my next two novels will feature chemistry and also biology. 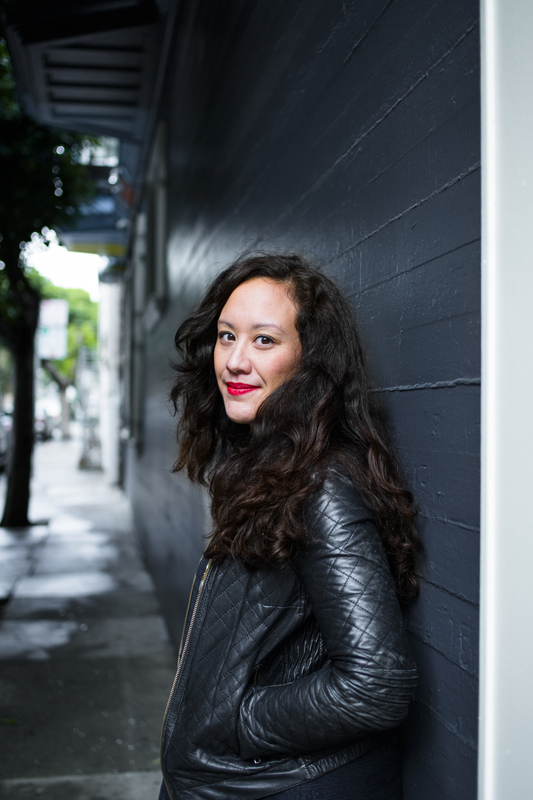 Antonia Hayes, who grew up in Sydney and spent her twenties in Paris, lives in San Francisco with her husband and son. Relativity is her first novel. "Relativity is wonderful, a beautifully written, heartbreaking novel that I feel certain will find the huge audience it deserves."